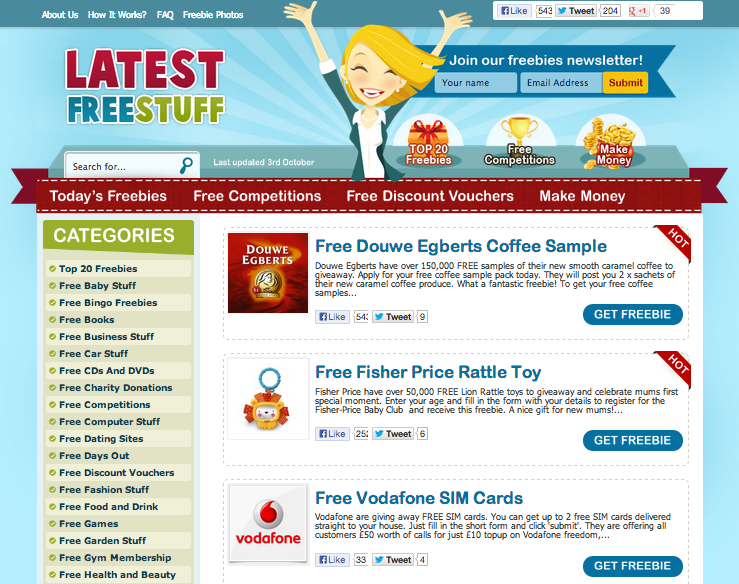 Latest Free Stuff UK is a website that provides great freebies, free samples, coupons and special offers on a daily basis. Trawling the web for freebies given away by companies as little incentives or advertising, Latest Free Stuff UK puts them all together in one convenient place, for you to shop and browse at leisure. They never post spam links, and all freebies are independently verified, meaning you get exactly what you want– and no spam marketing. Also great products for very cheap, if you don’t mind paying a little bit- like Swarovski earrings for £3.99! Totally free stuff on the site doesn’t just include testers or small gifts: there are competitions and discount vouchers for you to get a whole lot more! Getting free stuff themselves is easy- just register for that freebie, and here it comes! Freebies can have limited stock, so best to get in early and make sure you get some! Sign up to their weekly newsletter to receive hundreds of great free stuff and discount information as soon as it appears! Latest Free Stuff UK seems like a fantastic site- with very few negative reviews (though admittedly, very few reviews at all) and very little that could go wrong- all freebie-sourcing comes from the companies themselves, not the website- all it takes is a bit of time signing up, and a little bit of patience waiting for orders to arrive, and you can get all the freebies you’ll ever want. Ideal for those people who like to save money any way they can, and try some great new things along the way. Go back to Free Goods and Services category to find other interesting websites and organisations offering freebies.